A macabre and brooding tale of an 18th century village on the edge of extinction, plagued by a grim abominable horror. "Affliction" is what the remaining townspeople call it. 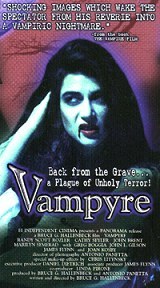 But it certainly is vampirism, and it certainly is thriving with bloody ferocity in the town of Courtempierre. Each night breeds dread and terror, and those that can still pray for dawn have little hope of surviving another day. Into their midst comes a strange and mysterious man with profound visions who had done battle with vampires as a child and now has returned to confront the undead once again. But time is precious, and as the circle of evil closes ever tighter around them, this savior must seek out and destroy the cabal of vampires responsible for the unholy epidemic. Only then can the living - and the dead - rest in peace.